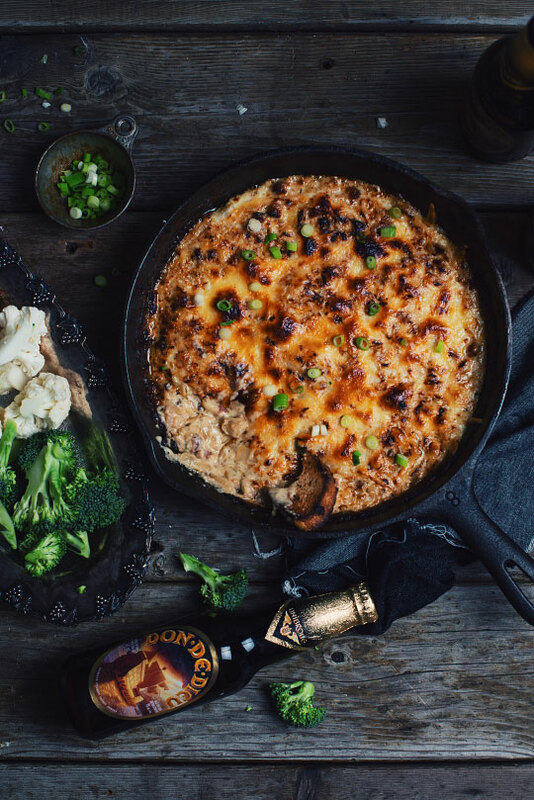 This cheesy dip with beer caramelized onions is the summum of decadence. Perfect for any game nights of during the holidays! In a big skillet at medium heat, melt the butter and add the onions. Add about 2 tablespoons olive oil, season with salt and pepper then stir well. Cook slowly for 8-10 minutes while stirring often. Onions must not sear! Lower heat if that is the case. Meanwhile, in a skillet at medium heat, add a small drizzle of olive oil and cook the pancetta for 5-6 minutes until it gets crispy. Deglaze with the beer and scrape the bottom in order to grab all the flavours then pour in the onion mix. Add also the fresh thyme and stir well. Continue cooking the onions or about 10 minutes, stirring often, until they are dark and caramelized and that liquid is evaporated. Pour the onions in a big bowl and add the Gruyère cheese, 1 cup cheddar, sour cream and cream cheese. Stir well to combine and pour in a baking dish. Place in the oven and cook for 20 minutes. Remove from oven, stir well and add the rest of the cheddar on top. Place back in oven and cook at broil for 2-3 minutes until cheese is golden! Let cool down 10 minutes before eating. Garnish with scallions and serve with croutons, chips and veggies. It's time to celebrate with this sparkling Brut from the Bernard-Massard house. A nice blend that brings notes of grilled almonds, grapefruits and pear. Whites from Austria are really in! Slightly mineral and offering white flower, honey and lime aromas, this wine will go perfectly with this hearty dish! You will like this Belgian beer matured in a chardonnay oak barrel for the notes of citrus fruits, peach, vanilla and white wine. 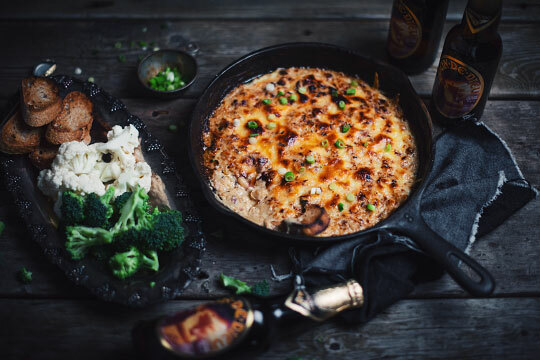 It’s a very dry beer that won’t distort the delicacy of the scallop but still make a burst of flavor with the Pineau des Charentes wine in the sauce.